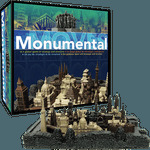 Based on the award-winning Cathedral™ game, this captivating edition surrounds players with 32 monuments depicting buildings, statues, temples, and historical sites from around the world. By using strategy and well-structured moves, players try to position their 14 monuments on the playing area bordered by The Great Wall of China, the West Wailing Wall, the Wall of Marrakesh, and the Zimbabwe Ruins. With a combination of precise planning skills, a 'People Piece', and beautifully detailed playing pieces to enjoy, players are intrigued from beginning to the end. 1 polystone playing surface, 28 monuments, 1 "people" piece, instruction booklet.